Eraser mildew stains, for good! McKee’s 37 Marine & RV Mildew Eraser Pads utilize the latest in advanced foam technology to cut through stubborn mold and mildew stains when paired with our hugely popular Mildew Remover. 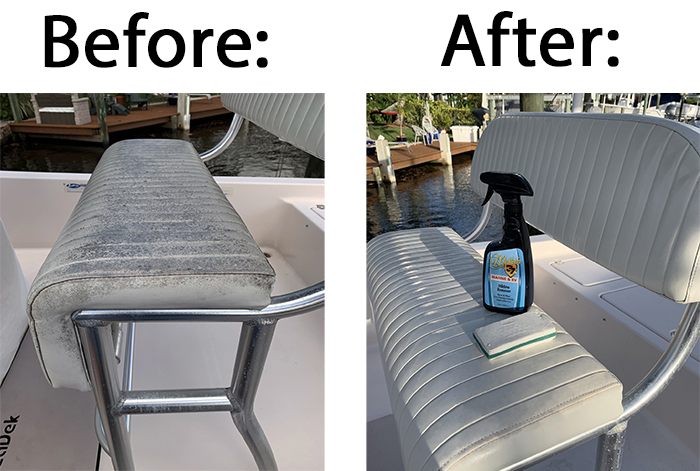 Constructed out of a special melamine resin that cures into a super tough scrubbing foam, Mildew Eraser Pads quickly and effortlessly remove stubborn mold and mildew stains from vinyl seat cushions, rubber bumpers, fiberglass, and virtually any other part of your boat or RV that’s plagued by mold and mildew stains. Not all scrubbing pads are created equal! The secret behind the effectiveness of the McKee’s 37 Mildew Eraser Pads lies its advanced foam technology. What starts as a melamine resin cures into a durable foam that acts like super fine sand paper to scrub away stubborn mold and mildew stains. What’s more, both sides of the Mildew Eraser Pads have raised nubs that further enhance the scrubbing power. The blue foam core provides cushion for your hands as you scrub away years of mold and mildew stains. Tip: Always use McKee’s 37 Mildew Eraser Pads with McKee’s 37 Mildew Remover. This dynamic mildew-removing duo annihilates stubborn mold and mildew stains from your boat or RV. Follow with McKee’s 37 Mildew Protectant Spray for long lasting protection!